Advances in processor technology, in graphics processing and display, highly reliable and standardized networking electronics have given us platforms with the intelligence, low power consumption, small size and attractive pricing that will allow the development of a vast array of medical devices. The hardware component is in place in terms of sensors, processors, power supplies and displays for OEMs to assemble systems that would put Dr. Leonard McCoy to shame. What is not yet fully in place is the ability to clearly and reliably implement the functionality—otherwise known as software—and a fully reliable and ubiquitous network infrastructure with the necessary bandwidth to deliver the promise of all the devices that are coming out of the creativity of developers. Advances and enhancements to a given device’s software content can significantly change and improve its functionality and value, often with no changes to the underlying hardware. Connectivity bestows two major benefits. The first is increased patient independence and mobility along with constant monitoring of selected conditions that allows instant alerting of medical personnel without a scheduled office visit. The second is the aggregation of data from different devices or the combination of inputs to a central clinical decision center where specialists and more advanced diagnostic analysis can quickly be applied to the data. The problem with software is that it is difficult to test fully and exhaustively. Nonetheless, we have extremely reliable software in the aerospace arena thanks to standards such as DO 178B. Now, in addition to software testing, there is a growing trend toward static analysis—initiating a sometimes rancorous debate among proponents and opponents of both approaches. Standards such as IEC 62304 require extensive documentation of traceability and of the development process as a prerequisite to certification. This is especially important in view of the need to reuse previously developed code that may not have originally been subjected to such requirements. 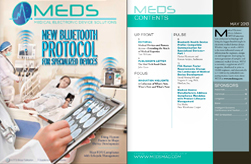 Universal connectivity for medical devices is a combined hardware/software challenge. There needs to be an eradication of “dead zones,” first within buildings such as hospitals and medical facilities, but eventually overall, which is a prime objective of such organizations as West Wireless. Given a reliable wireless infrastructure, there is then the need for standards for protocols that will make the vast number of wireless devices interoperable and give them the ability to seamlessly exchange data safely and reliably. This is the mission of the Continua Health Alliance, which now counts more than 230 member companies. Certifiably reliable software on reliable hardware with the ability to seamlessly communicate and interact and to do so at a level at which a non-technical patient can intuitively participate, represents a shelf full of Holy Grails. But these are prizes well worth the quest.